Sitting quietly and almost hidden in composer and conductor John Williams’ immense body of orchestral work is a gentle, but insistent, almost five minute composition called “Song for World Peace.” It’s part of his “American Journey” album. The idea that earth’s seven billion inhabitants could live together without strife is a concept almost too large to comprehend. But, Williams’ musical development of “Song for World Peace” is a metaphor, of sorts, of how peace might come to our planet. French horns introduce a simple theme that is echoed by flutes, later by clarinets, then strings and the entire orchestra. But, slowly, the theme dies out and falters. Williams then begins a new, but complementary, theme. Again, it begins somewhat tentatively, but it grows much richer and more confident, bringing an affirmation that peace may, in fact, be possible. World peace would imply that individuals are at peace, too, meaning that the tiny moments of impatience and the bigger moments of personal anger would not exist either. The sometimes strong desire to honk at the slow driver and harsh words would yield to love and compassion. It is a tall order. Which raises the question: Would I be ready for world peace if it should break out? And, even more important, how am I waging peace in my life? What are my individual peace efforts? Philanthropist Kathryn Wasserman Davis provides her own practical example. “I want to use my 100th birthday to help young people launch some immediate initiatives,” she said, “—things that they can do during the summer of 2007—that will bring new thinking to the prospects of peace in the world” You can learn about her work here. 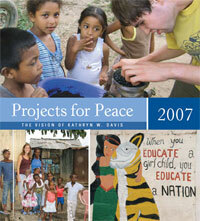 It was such a successful effort that 100 Projects for Peace continues in 2008. How do you prepare for peace?